Gary would like to have a word with you... It won't take much, as he only has one thing to say to you. Vault 108 might be the creepiest location in Fallout 3, and there are some pretty creepy locations. Located in the Wasteland, south of Canterbury Commons, vault 108 was one of Vault-Tec experimental vaults. This one had a cloning facility where the vault's identifying feature was created: Gary. Vault 108 Gary was cloned at least 54 times, and each clone was more psychotic than the last one. Why did the vault scientists continue to make Gary clones? The reason is unclear. It would seem that at some point the Gary's began cloning themselves. 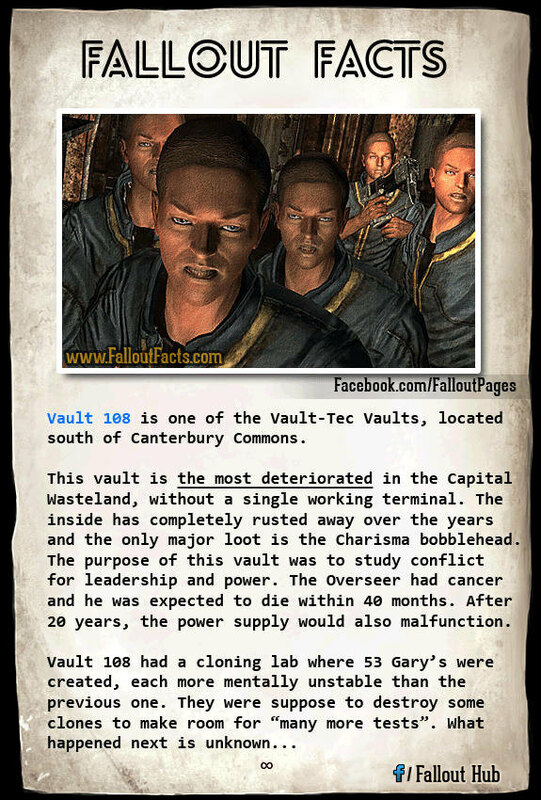 All the Gary clones were hostile towards anyone who wasn't “Gary.” Because the Gary clones were all violent, and the vault was running out of space in the “observation rooms” to house them, the vault staff decided to “terminate” the clones. Although they apparently had plans to continue making Gary clones. The holodisk in the cloning lab offers little explanation; only more mystery. It is apparent that these weaknesses in the vault infrastructure, the power vacuum in leadership roles, and the dull and stressful living conditions created a situation of vulnerability for the psychotic Gary clones to exploit. Perhaps, once they learned of the cloning facility scientists' plan to start killing the Gary clones, they decided to develop their eerie method of communicating. The Gary clones communicate amongst themselves by simply repeating the name “Gary” in various tones, with each tone fraught with meaning. Whatever the final instigating trigger was, they decided to revolt. Unfortunately for the scientists, this particular vault was stocked with three times the normal weapons in the armory!